Almost everyday I find a new phrase that makes the Spanish I know - from Ecuador - a different language than the Spanish spoken here in Spain. Sometimes I wonder if it is comparable to English in different countries (I do remember not understanding much during my first classes in New Zealand), but I think the differences from Ecuador and Madrid's Spanish are even more prevalent. I love learning new words and phrases in English, my native language, but it is obviously much easier to pick up on new things from a language in which I am not quite fluent. (Fluency is a whole 'nother topic for a different day). While I'm disappointed that one of my favorite words, chuchaqui, is not used here, I've filled my vocabulary with a few other new favorites. 1. 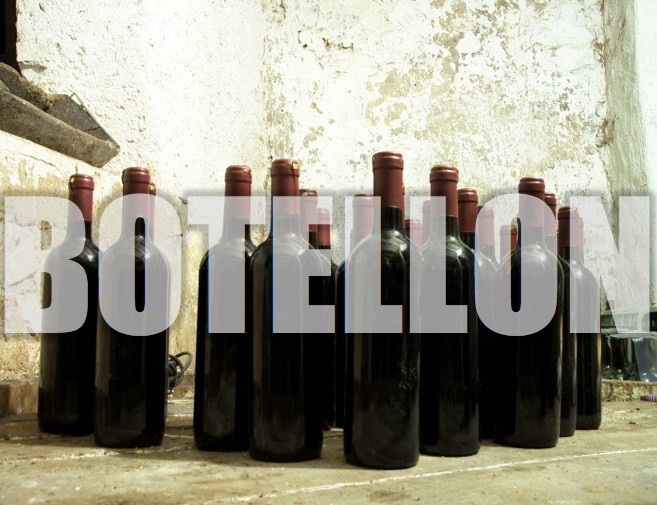 Botellón (boh-tay-own) refers to a group of people drinking outside in a public space. Money is collected. Bottles, cans, cups, ice, whatever are bought. And then the gathering begins in the park, plaza, street or beach. Although drinking publicly is technically illegal here, it is definitely not enforced and botellónes are a common activity. They're cheaper, spacious, and have a better atmosphere. I'm in! 2. 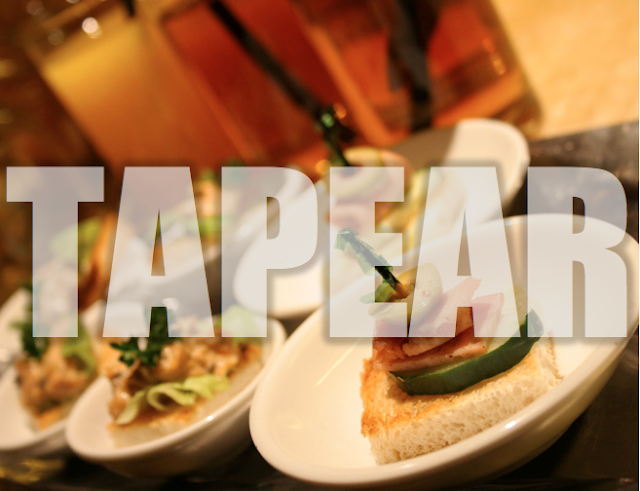 Tapear (tah-pay-ar) is a beautiful verb describing the act of going out to eat tapas. You know tapas, right? Little plates of delicious food that normally come free with a drink and perfectly accompany a glass of sangria. You can take whatever comes with your drink or if you're looking to create a meal, choose from a menu to order your own. 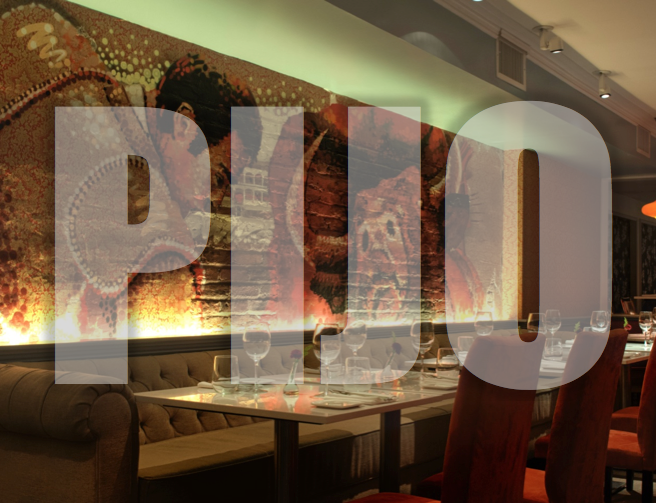 While tapas are great, the act of going out to tapear is about more than just the food. It's about the company, the drinks, and the hours of conversation over many tiny plates of croquettes and calamar. 3. 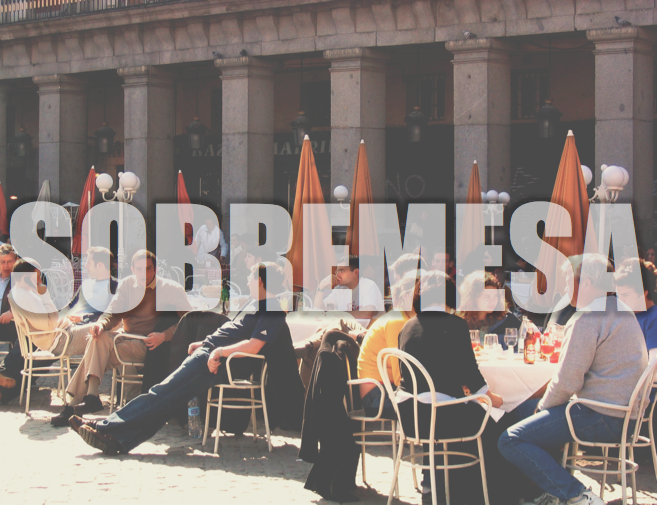 Sobremesa (so-breh-meh-sa) is a cultural act, a common occurrence, and it can often happen after you go out to tapear. It is the time when the plates have been cleared, the coffee has been served and the conversation continues. Meals are important in Spanish culture and meant to be enjoyed. Employees even often have at least two or three hour lunch breaks with plenty time for some sobremesa. 4. Pijo (pee-ho) is a slang word that doesn't need too much explanation. It is a noun for a snob, a yuppie, or a spoiled person. I just enjoy when I hear Spanish speakers use the word in conversation. It has a short, sharp sound and while pijo (or pija for a female) doesn't normally have a positive connotation, it can also be used playfully. 5. Zurdo (Zoor-doh) may only be special to a specific group of us, the left-handed people of the world. 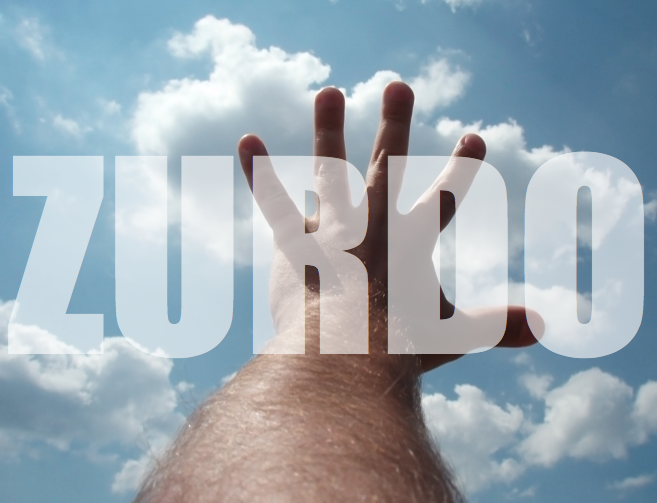 A zurdo (or zurda) is the word for a lefty. I think it's interesting because it isn't really related to the Spanish word for left: izquierda. I love having a specific word to call myself rather than just being left-handed. No doubt, I am proud to be zurda. 6. Vale (vah-leh) is a word that I probably hear at least 50 times a day. Sometimes 50 times in a single conversation. Vale means "OK." Or "Yes." "Yeah." "Yup." Right, you get the idea. I like to use the word repeatedly and pretend like I'm a local. 7. Guiri (gi-ri) is the term for a tourist or a foreigner. It's not meant to be an insult, but like most words, it can be used negatively as well. Some people don't like the term guiri, but I see it more as a fact: I was not born in Spain, Spanish is not my native language, and I have not been here long enough to be considered a local. Maybe once I start eating dinner at 11 o'clock at night and habitually greet people with two cheek kisses, I'll be able to lose the guri name. Until then, I'll proudly accept it. 8. Hasta Luego (ah-sta lu-ey-go) is a phrase everyone learns in their 7th grade Intro to Spanish class. It translates directly to "until later" or "see you later" so we assume to use it in the same context. 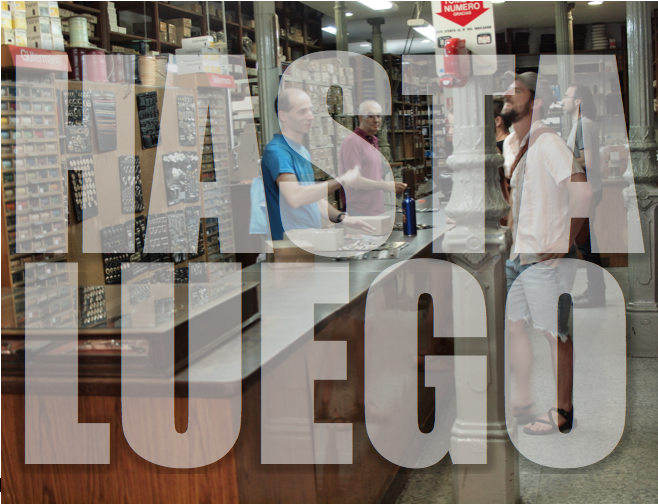 I was very confused the first time a random shop clerk said "Hasta Luego" as I was leaving because I definitely had no plans to see him later or ever again. But in Spain, it can be said for any type of goodbye. When using this phrase, say it quickly and turn it all into one long word. Drop the beginning and emphasize the "O." When you get it down, no one will think your a guiri. "Staluegooooo!" 9. 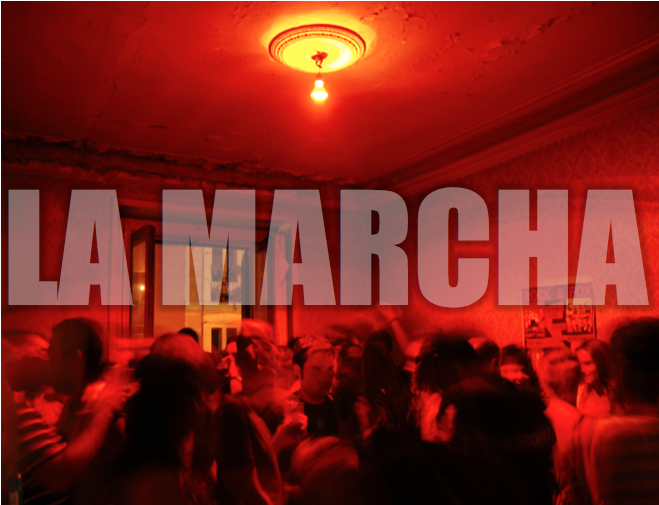 La Marcha (lah march-ah) is simply put, the march. It is the word for all nightlife in Spain. The nightlife that when you ask how we'll get home when the metro closes at 1:30 a.m. and the Spaniards respond, "No problem, it opens back up at six o'clock." La Marcha is nothing to be taken lightly, but it's something to be enjoyed fully. 10. 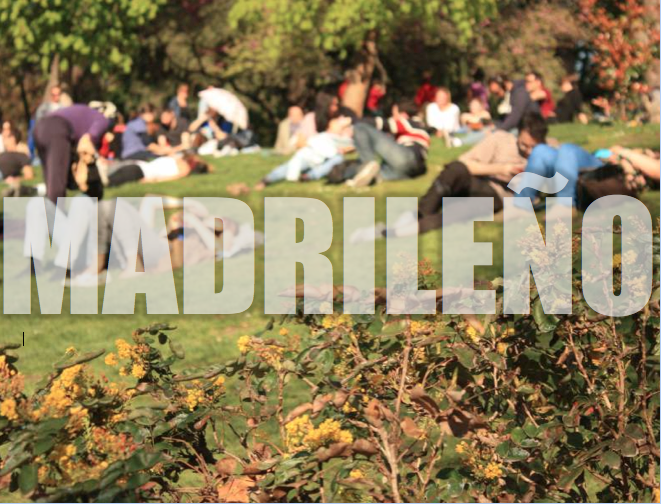 Madrileño (mah-dree-len-yo) is somewhat the opposite of guiri. 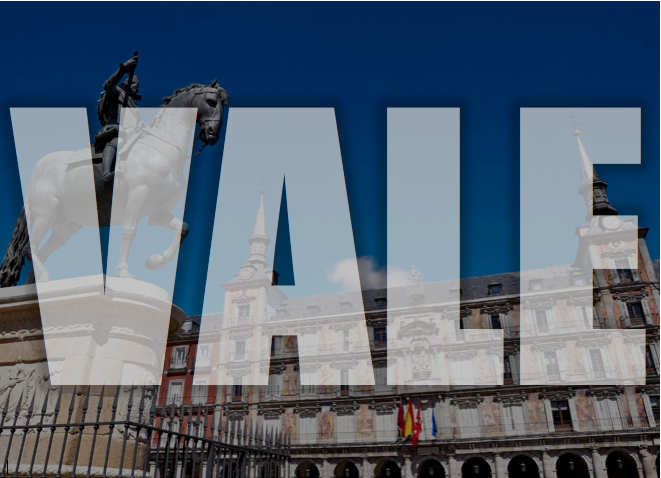 If you're from Madrid, you live in Madrid, or you associate yourself with any and all things Madrid, you are Madrileño (or Madrileña for girls) and you shall be proud of it. So, what did I forget? What are your favorite Spanish words and phrases? This post is AMAZING!! 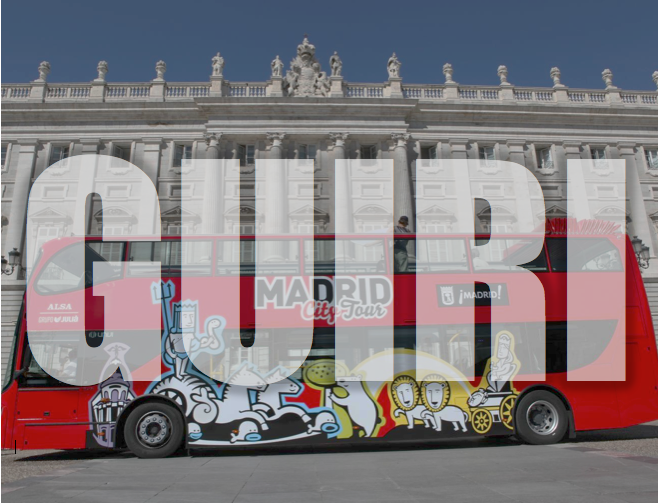 I couldn't agree with you more - these are some of my favorite (and probably most used) words here as well :) Embarrassing confession: I've been practicing my madrileño "hasta luego" for weeks now, but I still sound like such a guiri. Maybe one day I'll get it down! I eat dinner late, even at 12:00 sometimes and do the two kisses on the cheek. According to your explanation, I should consider myself a Spanish now. Well, I don´t know a word of Spanish. Haha yes, you sound like a true Madrileño! Thanks for stopping by! Haha I loved this post! These are all very practical, legit, common words used in everyday Spanish here in Spain. Beautiful pictures to go along with the words, too. Love this post! Lots of these I picked up living with my Spanish roommates. It's so confusing at first because no matter how much you learn in a Spanish class, the colloquial language comes as you go! Awesome post, really enjoyed reading! !